You don’t have to live in a wormhole to know that people are a little angry about some of the proposed changes for the next update, Hyperion. 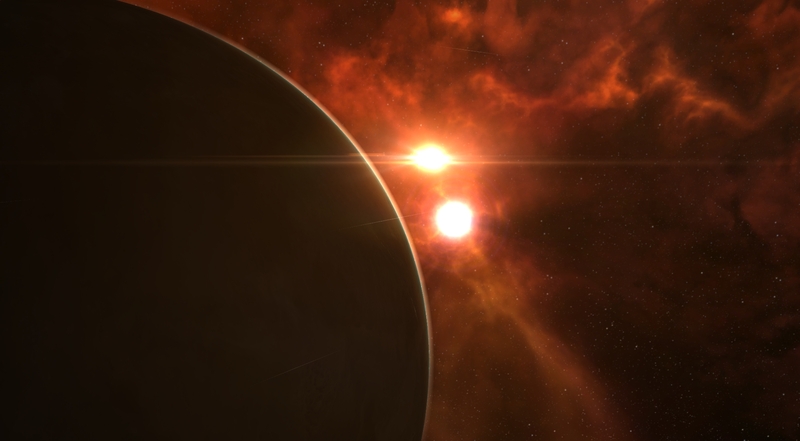 This dev blog by Fozzie goes into the details of the changes, but if you’ve never lived in a wormhole yourself you might not be able to fully understand their impact (and the resulting anger). Let’s take a look at them one by one. Might as well tackle this change first, as it is the one that has caused the most uproar. CCP is looking to implement a system where the mass of your ship determines how close to the wormhole your ship spawns when traversing. Jumping through a wormhole is not like jumping through a gate in k-space. When you jump through a gate in k-space you end up a certain distance from the gate depending on the size of the gate itself. Currently, when you jump through a wormhole you appear within ~7 km of the wormhole (which has a 5km jump range). Below is the chart with the new spawn ranges based on mass from the dev blog. Now, you might be looking at the numbers for carriers and dreadnoughts and wonder why people would be upset about these changes. Shouldn’t this make it easier for players to catch capitals that are being used to roll holes? Shouldn’t wormholers be happy about the chance of getting more shiny kills? Well, the main complaint with this change boils down to one thing that many people who live in w-space are constantly looking for: content.The table is by no means an exhaustive list of ship types, but it gives a decent picture of the distance you could see when jumping through wormholes. 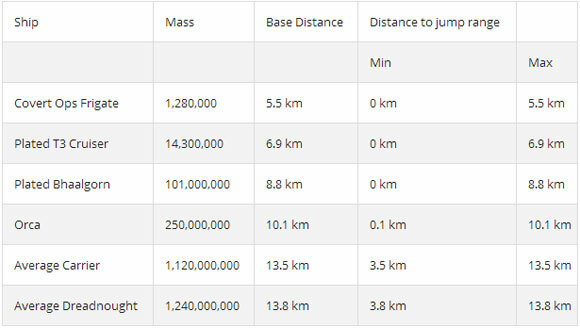 It also shows you the minimum and maximum distance you would need to travel to get back within jump range of the wormhole. After taking in player feedback on the original proposed numbers (which were much larger), CCP decided to add a small deviation of 2 – 5 km in either direction depending on how fresh the wormhole is and dial back the numbers for larger ships a touch. It is worth noting that this still angered players as these changes were posted a mere 10 minutes prior to the wormhole townhall with many feeling the meeting was a little useless at that point. For starters, it gave people attending zero time to think about the new numbers and test them in practical terms on SiSi. It also begs the question of whether CCP would be willing to even look at the numbers again having just altered them. To understand how a change that seems to create more fights can lead to less content you must understand something about w-space – a lot of it is quiet and empty at any given time. On a busy day in my corp, we can end up rolling our static connection a handful of times looking for either an interesting k-space exit or a wormhole that has people actively doing something in it. Larger groups have also been known to rageroll (collapsing your connection over and over) while looking for something to do. Rolling a hole involves jumping ships back and forth through a wormhole until it hits its predetermined mass limit and collapses (it’s even less exciting than it sounds). Any change that makes that harder and more annoying to do means it will get done less, leading to decreased content and more bored pilots. The complaint many players have isn’t that this makes rolling more dangerous, it’s that it will make rolling more tedious. It may prove faster to web-warp a capital ship to a nearby planet and then back to the wormhole than it would be to slowboat that same capital back to the hole itself. Even with web-assisted warps it will make an already dull part of wormhole life even duller. It’s impossible to say for sure what the exact effect will be on any given wormhole entity. The issue with this change is how it will affect those who want to use caps in a hostile wormhole for a fight. Currently on TQ you can jump a carrier in to provide logi during a fight and you can easily jump the carrier back to your own wormhole if things aren’t going your way. After these changes the carrier is likely to be too far from the hole to be able to jump back immediately, and you can bet the enemy will be webbing and bumping the carrier as soon as it drops cloak. This means that you need to win the fight or you lose your carrier, meaning players will be far more hesitant to bring caps in the first place. This change is generally better received than the former one, though that doesn’t say much. If you don’t know what a static is, let me briefly explain. Every wormhole has at least one “static” connection. This doesn’t mean that the system it connects to is always the same, just that the type of system it connects to always remains the same. If your home wormhole has a C3 static you will always have a connection to a C3 wormhole. If you collapse that connection another wormhole to a different C3 system will immediately spawn. Many people are happy about opening up more connections within w-space. Anything that gets more people moving around and hunting is generally considered a positive. The main concern many are raising with this is you could potentially end up getting a new static added to a wormhole you’ve been living in for years that would potentially have made you never move in there in the first place. A smaller wormhole corp that lives in, let’s say a C4-C2 (class 4 wormhole with a class 2 static), could end up getting a new class 5 static. A small corp would find a C4-C2 attractive because the majority of C2 wormholes have a high-sec static. This makes logistics for them easy and they don’t have to worry about a much larger entity evicting them. If this corporation’s home also gets a C5 connection overnight they are now vulnerable to a large wormhole group evicting them. This change could potentially cause some people to leave w-space, or to at least consider relocation to a different system. You might laugh and say good riddance to the carebears, but fewer targets in w-space is something to be avoided. Not a lot to say about this change without going into lots of detail and numbers, so I’ll just link to the dev blog (scroll down a bit, it’s near the top) and say that these changes look good and the playerbase seems pretty happy. If you weren’t aware, some systems in w-space have a built-in effect that is always there and modifies all ships in the system in some way (more shield HP, for example). 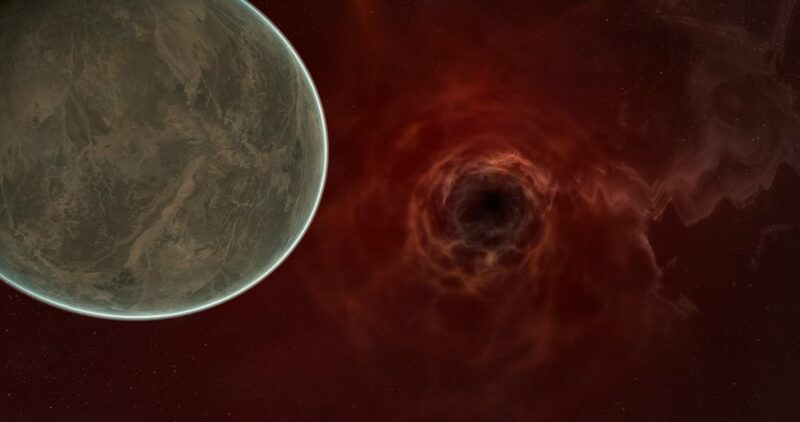 Some of those effects (namely the black hole effect) have been really terrible since wormholes were introduced into the game in the Apocrypha expansion back in 2009. I won’t clog this article up with tables of numbers for each effect, so if you are interested I suggest you go check out the dev blog. This is probably my favorite change in the whole Hyperion release. A K162 is an exit wormhole. In the new C4 static example I used earlier of the corp living in a C4-C2 the people in the C2 wormhole would see a wormhole with the name of K162 on their side, meaning that the wormhole connection originated from somewhere outside of their wormhole. Currently a K162 appears whenever someone warps to the wormhole on the other side (in the C4 in this example). Ever since the release of the Odyssey expansion brought us the Sensor Overlay players who live in wormhole space have complained about K162 appearance needing to be changed. A group running sites that suddenly has a K162 spawn in their hole can immediately see it in space thanks to the sensor overlay and can begin getting to safety before anybody from the other wormhole jumps in. With this change you will be able to at least get inside the wormhole before the residents realize anybody has connected to them. While that might not seem like much it can give you a enough time to get tackle on a carrier that is running a site. The goal of this change is to create more random (not static) connections throughout wormhole space, and the way they are doing that is twofold. The first is increasing the spawn rate of random “wandering” wormhole connections. These connections can be from w-space to w-space or w-space to k-space and do not last for the full 24 hours of other connections. The second part of this change involves the creation of a new type of wormhole connection that only allows frigates, destroyers, and heavy interdictors running multiple bubbles due to the small maximum mass that is allowed to jump through. These new wormhole connections have a 16 hour lifespan and are unique in that they are the first type of connection to regenerate mass over time, making them nearly impossible to collapse. The big complaint about these new wormholes is that a lot of w-space residents currently have pods that are worth way more than a frigate. Enclosing such a pod in something like a frigate may prove a risk many aren’t willing to take (and gives yet another excuse to ask for the ability to switch clones in w-space). An incentive to use ships other than T3s in w-space is always a positive change, but there are some questions about what frigates and destroyers are capable of actually doing within w-space. A large enough group of them from a big WH entity could surely wreak some havoc, but a smaller group may be easily driven off. Time will tell what kind of content these new wormhole connections drive. Not much to say about this change other than that it still isn’t alliance bookmarks. CCP is allowing players to copy more of them at once and at a faster rate. This is useful for alliances living together in a wormhole to ease some of the pain of making copies of all the bookmarks for the chain that day. Fozzie’s forum post also mentions that alliance bookmarks are coming eventually, so that should silence some of those seeking this functionality. This change was recently announced and added to the dev blog as CCP initially didn’t think they could get it finished in time for Hyperion. If you play in the AU timezone this is likely your favorite change. Currently after downtime the signature ID of all the sites and connections in your wormhole change. This is a frustrating issue for people who play before and after downtime as you need to keep track of what every signature is in order to watch for K162s. Rescanning everything all over again after downtime because the IDs changed is an exercise in frustration. CCP is finally fixing that issue and the response is understandably very positive. That’s all for the wormhole changes coming in Hyperion. 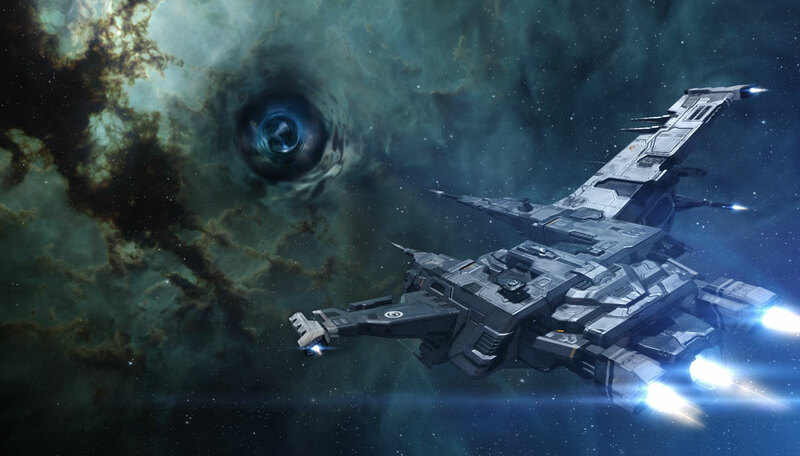 We’ll have to wait and see how these changes affect the meta of w-space when Hyperion releases on August 26th and if the initial community response to the wormhole jump mechanics will end up being an overreaction or if CCP will dial it back in the future. If nothing else, it’s definitely nice to finally see CCP spending some development time on wormholes.